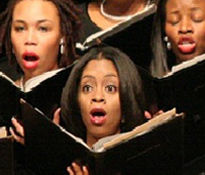 The Spelman College Glee Club has launched a video campaign with the goal of securing a performance slot at the 2013 Presidential Inauguration taking place Jan. 21, 2013. Along with viewing, liking and sharing their video, the choir is also asking the public to support their campaign by reaching out to their congressional representatives to inform them of their interest in seeing the group perform at this historic event. Visibly inspired, First Lady Michelle Obama and global media leader Oprah Winfrey both gave the Spelman College Glee Club a standing ovation when they heard them perform their commanding signature song “A Choice to Change the World.” Hoping to get the same reaction from President Barack Obama and the nation, the 50-member choir has launched a video campaign with the goal of securing a performance slot at the 2013 Presidential Inauguration on Jan. 21, 2013. Along with a written correspondence to the Joint Congressional Committee on Inaugural Ceremonies and other White House representatives, the glee club submitted a video proposal which highlights how “A Choice to Change the World” embodies the Spelman mission of empowering women to excel intellectually, act globally and lead boldly as well as President Obama’s vision of forward movement through meaningful change.The choir is also asking the public to support their campaign by viewing, liking and sharing the video proposal as well as reaching out to their congressional representatives to inform them of their interest in seeing the group perform at this historic event. In both 2008 and 2012, Spelman College students actively participated in voter education and registration initiatives by hosting debate watch parties and taking voters to the polls. By performing “A Choice to Change the World” at the 2013 Presidential Inauguration, Spelman students will once again bring attention to how committing to positive change inspires and creates a better world. Founded in 1881, Spelman College is a highly selective, liberal arts college widely recognized as the global leader in the education of women of African descent. Located in Atlanta, Ga., the college’s picturesque campus is home to 2,100 students. Outstanding alumnae include Children’s Defense Fund founder Marian Wright Edelman; Sam’s Club CEO Rosalind Brewer; JPMorgan Chase Foundation President Kimberly Davis; former acting Surgeon General and Spelman’s first alumna President Audrey Forbes Manley; Harvard College Dean Evelyn Hammonds; author Pearl Cleage; and actress LaTanya Richardson Jackson. For more information, visit http://www.spelman.edu.